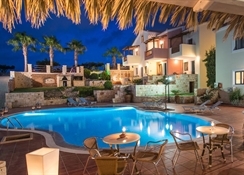 Diamond Village Apartments is a luxury 3-star hotel complex located in Hersonissos, Crete in Greece. The property, which is located against the backdrop of a peaceful hillside, is 350m away from the Hersonissos beach. The hotel houses a large swimming pool, surrounded by loungers and terrace garden. The swimming pool overlooks the Cretan waters on one side and the wilderness of the hills on the other. The hotel’s proximity to the Piskopiano village, which is just 1.5km away from the hotel, offers the guests a unique opportunity to experience the Greek lifestyle up-close. Apart from that, the hotel is located quite close to several tourist attractions, allowing the guests to experience the heritage and culture of Greece. 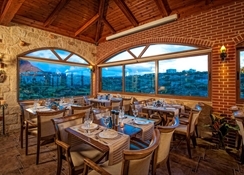 The property houses multiple bars and restaurants that serve a variety of International and local Greek cuisines along with alcoholic and non-alcoholic beverages. The Diamond Village Apartments is located 23.6km away from the Heraklion International Airport and 103km away from the Sitia Public Airport. The Hersonissos Beach is 350m away from the hotel. The Limenas Hersonissou Beach is 650m away from the property. The Piskopiano village is 1.5km away from the hotel. 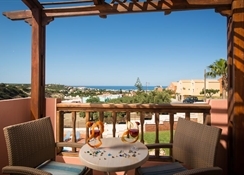 Tourist attractions like Aquaworld Aquarium, Lixnostatis Folk Museum, Labyrinth Park, Acqua Plus Waterpark, The Crete Golf Club, Malia Strip, Dinosauria Park, Cretaquarium Thalassocosmos, Watercity and Nikos Kazantzakis Museum are located within a range of 18km from the property. The Diamond Village Apartments has tastefully decorated apartments and studios that offer either a sea view or a garden view. 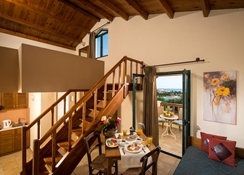 Studio with Garden View, Family Apartment with Sea View, Studio with Sea View, Maisonette with Sea View, Family Maisonette with Sea View and Suite with Private Pool are the types of rooms offered by the hotel. All the rooms are soundproofed and come with amenities like air conditioning, satellite TV, hairdryer, free Wi-Fi, refrigerator, desk, coffeemaker, safety deposit box, closet, among others. The bathrooms are equipped with bathtub, shower and essentials like bath linens, slippers and toiletries. The Diamond Village Apartments houses 3 restaurant and bars on its premises. The Diamond Restaurant is an onsite casual restaurant that serves breakfast, lunch and dinner. The Diamond Bar is a casual bar, with both indoor and outdoor seating area, that serves a wide array of local wines and signature cocktails. The Diamond Pool Bar, located on the poolside, serves local wines, cocktails, coffee and snacks through the day. The pool bar has entertainment evenings organised by the in-house animation team with live music. 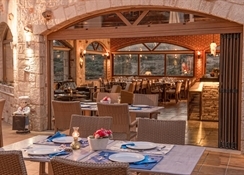 Guests can also visit the nearby Piskopiano village and try the local eateries and bars, which serve both local Greek and international cuisines. Apart from that, the Hersonissos Beach, which is just 350m away from the hotel, has plenty of eateries as well as bars and traditional taverns. The Diamond Village Apartments houses a large swimming pool on its premises, where the guests can enjoy pool games, sunbathing or the evening entertainment shows. The hotel’s proximity to the Hersonissos beach allows the guests to enjoy water sports like diving, etc. The hotel staff, on request, can also organise for activities like bike tours, walking tours, water park visit, horse riding, cycling, table tennis, billiards and golfing. The guests can also visit local tourist attractions like Aquaworld Aquarium, Lixnostatis Folk Museum, Labyrinth Park, Acqua Plus Waterpark, The Crete Golf Club, Malia Strip, Dinosauria Park, Cretaquarium Thalassocosmos, Watercity and Nikos Kazantzakis Museum. Rooms had been recently refurbished , very good and cleaned daily staff very friendly and couldn't do enough for us, nice place to stay , a good holiday my kids enjoyed it , thanks.